When there’s something that needs cleaning, sanitizing, washing, absorbing, collecting and storing, you know you’re in the ever-growing jan/san maintenance product market. 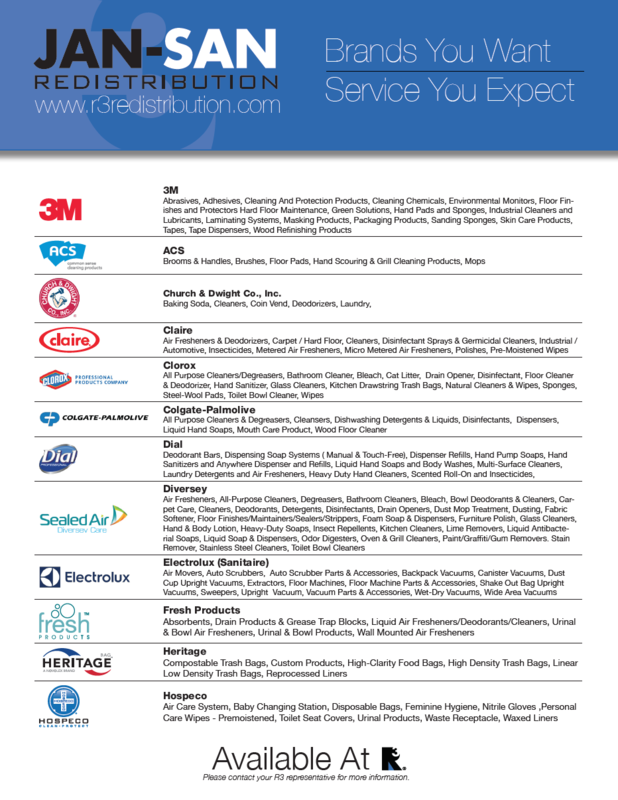 R3 has the products, knowledge and expertise to make sure you have the right item for whatever your customer needs. We stock everything a company requires to maintain the comfort, integrity and safety of its business – from paper products and cleaning supplies to janitorial equipment and carpet care. Explore our Jan/San Catalog items. You may view an interactive catalog featuring our full line of R3 products, or download just the Jan/San section as a PDF from the link below. You may also view our other specialty catalogs or download the available PDFs.